The Pinspot LED Quad DMX comes with a wireless IR remote to control color fades, built-in shows, dimming, strobe, black out and sound activation. DMX connections allows users to connect and control multiple units at the same time from a DMX software or hardware controller. Considering purchasing the American DJ Pinspot LED QUAD DMX? Have questions? Ask people who've recently bought one. Do you own the American DJ Pinspot LED QUAD DMX? Why not write a review based on your experience with it. Finally!! !, a quad LED pinspot from adj, way better than gels!! Nice beam angle and colour, but could be a tad bit brighter!! Still great-It's ADJ!!!! +its got dmx!!! Great pinspot for the money. Easy to use & setup as a pinspot for a mirror ball or just accent lighting. Great little light shame about the price tag - but worth it. Great Product, although one of the fixtures missed a remote. Trying to get another sent to me. Have used the 2 pinspots a few times now. They sit on top of my bank of four Cob led lights. My only complaint and this is only a small gripe. They could do with a few more wattage in terms of power. Overall a good pinspot and has the options of DMX or a remote pad. 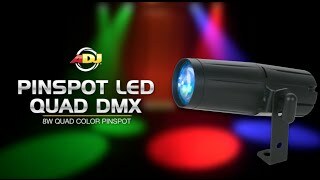 Seen a video for American DJ Pinspot LED QUAD DMX online or have you own video? 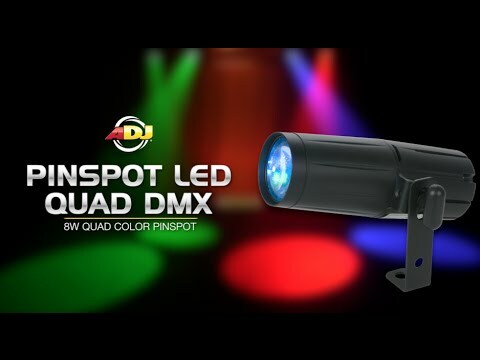 Check out American DJ Pinspot LED QUAD DMX on DJkit.com!